MrCaptivation wrote: I need them all. i've heard ppl talking about songs on the FB groups talking about having them.But won't share them. Location : In my own world. Unfortunately you get people who are like that. To be honest I don't believe that they even have the songs and just pretending that they have to get a reaction. That's sort of the reasons why I am a bit worried about kerli getting popular as you'll get more people like that. I agree,then they shouldn't be braging about it.I don't really like the moonchildren from the facebook groups. 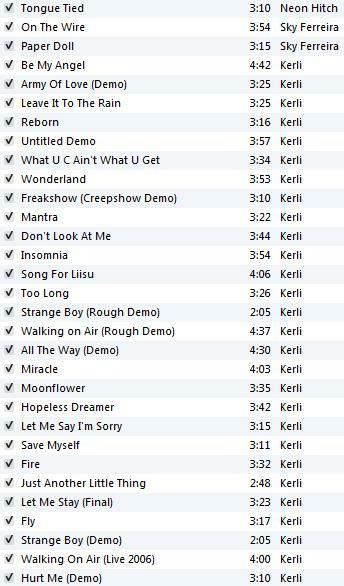 Many people in the Last Fm has several songs from Kerli. I hope they do not leak. I have insomnia and moonflower. LadyMimic wrote: To be honest I don't believe that they even have the songs and just pretending that they have to get a reaction. I agree. Like I had said you can just edit all that stuff in iTunes to make it look real. And since there has been such a buzz with Lucky Ones coming out I think this is just someone trying to fire us all up even more. They have songs yes. I've heard some of them. I have insomnia and moonflower. They're keeping them to themselves because to rare mp3 traders, those songs are currency in order to get other rare songs. Yeah, leaks are bad and it's good that the people who have them don't leak, but let's not pretend that they're doing it out of the goodness of their hearts. Chertograd wrote: They're keeping them to themselves because to rare mp3 traders, those songs are currency in order to get other rare songs. Yeah, leaks are bad and it's good that the people who have them don't leak, but let's not pretend that they're doing it out of the goodness of their hearts. Someone putted on soundcloud a preview (remix) of "Glow in the dark"
Why do you keep making new threads for things that could just be put in the same thread as before? But anyway, I love this! cant moderators just merge the threads into one? Oh right.Seen that page before. I think that list is fake. guys all time on last.fm is many song which wasn't released...some part leaked..
hmm..ok..No idea what to believe. Location : In a Black, Black World, there was a Black, Black Town. So cool..I hope they are for the new album...Kerli performed "Here and now" at identity festival right?.. Where are these pictures from? I've never heard of some of those! That doesn't really seem like a reliable source =/ I mean, is that supposed to be a screenshot of their iTunes? Because they can totally edit the song title and artist. stargirlstrike wrote: That doesn't really seem like a reliable source =/ I mean, is that supposed to be a screenshot of their iTunes? Because they can totally edit the song title and artist. weliton wrote: I have moonflower - mantra- insomnia - fire - WOA Demo - Freakshow and others. Lovely so if any of these songs leak without kerli's permission we know who the likely source is! How about you shush up about them?